Posted: Sat 07 Jan, 2006 11:44 am Post subject: Effectiveness of chainmaille? I know that chainmaille has been around for over 1000 years, and has seen use in almost every major conflict, but how effective was it? It looks to me to be quite flimsy and just an encumberance. (I know im probably wrong) But how well did it protect one on the battlefield, and from what kinds of attacks? Well, I'm not an expert on maille but let me say this. I make maille and, using 5/8" rings of 14 Ga steel wire, I hung a "sheet" of maille on a block of wood and tested that very question with a large fighting knife (nothing fancy, a homemade job a friend picked up for me one Christmas). 1. Wood is a lot more firm than flesh. In other words, a person's body would give more, allowing the links to flex and better absorb the impact. This probably translated into changing wounds that would tear through flesh into merely ugly bruises. 2. I make butted mail, I'm sure that rivted mail would have performed a bit better. I'm sure also that a tighter weave (say, 3/8" for example) would also have performed better-but of course it would also be heavier. 3. Finally, it took several very solid hits in about the same spot to break through. Presumably, a medieval soldier would not be standing perfectly still awaiting the inevitable penetration of a weakened point in his harness. In general, good mail protected its wearer extremely well. Piercing it with a one handed sword would have taken a great deal of luck, skill and strength, though some damage could be to the wearer done via blunt trauma. Mail was quite resistant to arrows and spears, but heavy thrusts and arrows from mighty bows could sometimes penetrate. For example, Sir John Smythe cites a French knight slain by an arrow that pierced the gusset of mail over his armpit. Polearms could probably rip up mail in the right hands, but weak or unskillful blows would be turned. This is the first online test that I've seen that actually involves a reasonable facsimile of contemporary mail. It has flaws however. The main one being the low draw weight of the bow but the range was shortened to partially compensate. Did that link work for anyone else? I tried it and came up with the spanish equivalent of "this site doesn't exist". I hammered the maille and after a few good strokes I was able to shear through some of the maille. I'd like to say that 5/8" rings are extremely large, even for 14 ga. The wire will bend more easily at that size. My own homemade mail is 14 ga, but I made it with 5/16" rings. The patch I made for destructive testing fared much better, even though it was butted as well. I tried it against arrows, a sword I didn't care about and an axe. Were I to switch to 16 ga. rings, I'd make them in a 1/4" to compensate. Anything weaker than that I reserve for jewelry. As far as the effectiveness of mail on the battlefield, if it didn't work, they wouldn't have used it for so long. But it is important to understand what threats it was designed to counter and what other items were brought into play to make it more effective. If you took a solid blow from a heavy axe and weren't wearing a lot of padding to absorb the hit, the force of the impact could still shatter your bones. But again, if it didn't work the way they needed it to, they wouldn't have kept using it. Even longer than 1000 years. I believe that fragments of mail have been found that date to 5th century BC. It was used by the Ancient celts and the Romans, who continued to use it even after they invented the "lorica segmentata". In India and Iran mail was used in battle up until the mid-18th century, in fact it was still being worn in the 19th century, but usually only for ceremonial purposes. Mail was still being used in the Caucasus and sub-Saharan Africa in the early 20th century. With regards to its effectiveness against arrows, read the 4th post here. I've just found this too. One of our archers put an arrow with a bodkin point from Historic Enterprises through both sides of a riveted mail shirt from GDFB at Ft. Mac last July on a bet from the owner of the shirt that he couldn't. The distance was at 50 yards and there was no padding behind the mail which was hanging from a cross tree. The bow was a self bow made from yew by the archer and had a draw weight of from 50-60 lbs. Ahhh...that link in the other forum worked fine. I'm amazed that a 50lbs bow couldn't penetrate at 5 meters. If you were an archer trying to stop the footman bearing down on you 15 feet away with that arrow....you're going to be pretty sorry in about 3 seconds. Yeah, I know 5/8" is huge. This was part of the first piece I ever made and I didn't know any better back then. :-) Now that I think on it, it could have even been 3/8" but that's still on the large side. Oh, before this turns into the usual argument that " only " period accurate maille using period accurate weapons will give us valid scientific results I am glad that someone comes forward with informal tests that at least gives us an idea what can expect from maille i.e. Minimal expectations. As long as one takes these for what they are, informal tests, and not generalize or draw cut in stone conclusions from them I think this can at least be entertaining. As in previous topic threads discussing this subject, the discussion becomes very focussed on why these tests are not scientific or valid ? I just appreciate hearing about " I tried such and such under these conditions and got this result. The frustrating thing for me is that the other discussions focus so much on how a valid test should done to be valid that NO idea is given of what the minimum or maximum expectations one should have about the effectiveness of maille. Now, don't get me wrong, I would welcome extensive scientific testing: I just wish that dogmatic opinions should come following the results and not before. With purely anecdotal evidence / observation we can get results showing just about anything but I still want to hear about them and I can come to my own conclusions. O.K. we get the opinion that bobkin arrows are ineffective against properly made historical maille and then we get an informal test showing an arrow shot with a much weaker bow than was used historically going through the maille ??? So, predictably we will get the explanation that the test wasn't under scientific conditions and the maille not made of the right historical materials etc ...... Valid objections I'm sure ( No sarcasm intended ), but I still wouldn't have wanted to be wearing that maille shirt. But the maille may have been below the historical standard of quality!? But the bow was also not that powerful ! Just a minor observation, with no wish to annoy anyone. When we use mail at my place of work for protection, it is against cuts, not stabs. It does work against the former, it doesn't against the latter. Modern mail is not, obviously, very similar in materials or construction to that used in battle in former times, intended as it is to protect against accidental self cutting rather than against intentional attack by others, but it does not seem unreasonable to expect series of holes joined and delimited by wire to work better against edges than against points. Allow me to correct my previous post, mail was not only used until the early 20th century, it is still in use today. As mensioned above, one shuld think of the maile as a layer in the armour. The textile parts are just as important as the maile. Most of the piercing damage would be haltered by the padded layers. All of course IMO! Good point that one should look at the whole protection afforded by maille and gambison: A few broken links can be repaired later and if the fabric padding stopped the point of sword or arrow completely or only allowed a very shallow wound the maille gambison combination did it's job well. I think it's important to not look at this as an all or nothing situation when thinking about armour in general. Even if maille didn't give you 100% protection against all piercing attacks it would stop a lot of low power thrusts and only a fully committed one " might " break through enough links to get past the maille and then the gambison gives you a reserve of protection. With no armour even slow and weak attacks can kill you and you are very vulnerable to draw cuts. With armour all the above attacks won't do a thing to you. Medium power attacks will either not penetrate or not enough to take one out of the fight and the wounds would be generally survivable barring death through infection long after the fight. Full power blows might well still seriously wound or kill. The point being that when we say that maille wouldn't have been used if it wasn't effective doesn't mean that it has to makes you 100% invulnerable to be considered effective. Getting out of the way is always better than taking hits on your armour as one can' t judge which blows are going to be among the 80% you don't have to be worried about and which are going to be the other 20% that will kill you. W.R.Reynolds said "One of our archers put an arrow with a bodkin point from Historic Enterprises through both sides of a riveted mail shirt from GDFB at Ft. Mac last July on a bet from the owner of the shirt that he couldn't. The distance was at 50 yards and there was no padding behind the mail which was hanging from a cross tree. The bow was a self bow made from yew by the archer and had a draw weight of from 50-60 lbs." W.R. the particular Spanish expedition escapes me at this time but there's a record of the Spaniards on this particular expedition making fun of the obsidion tipped arrows used by thier Inian allies so they hung a maille shirt from a tree and the Indiand shoot these arrows right through it. The effect however would have been quite different if the shirt had been on a body over a quilted coat. Yes maybe it's because a maille shirt just hanging causes the weight of the maille to pull on the links maximizing the size of the opening for the point of the bobkin arrow to wedge open / break one link and sail through. Also the weight pulling the shirt down stretches the whole thing making it possible for the force applied to be efficiently transmitted to the link. Maille over gambison on the body would just be very loosely under tension and a lot of the force of the arrow dissipated by the soft underpadding: The link under the point and the ones next to it just end up being pushed as a large area into the gambison. The difference between hit by a BB pellet and a tennis ball at the same level of energy. Hi everybody. I made the tests with the mail and the bodkin arrows. Sorry about the hoster but it is a free hoster and fault a lot. In a few days it will be right. My test perhaps isn´t scientific, but it is real. I don´t know how many J do my bow and my arrows, but ... look the rings. My solid rings are 1 mm thick and very, very hard. 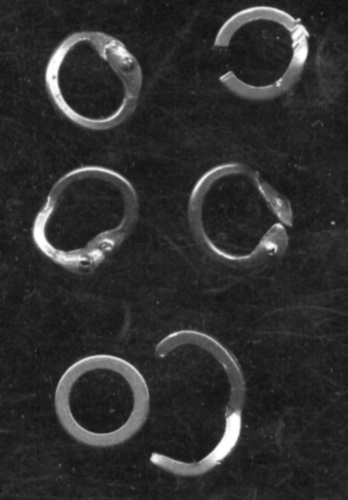 I´ll try to attach a photo with the rings before and after the impact. The bow was "only" 50 pounds but... too only 5-10 metres. My rings aren´t bad, I made it more or less like the old mailmakers but... It is mild steel, not wrough iron. The arrows were heavy, like war arrows. Everyone weighs 65 grames and the other 71 . They were made with fire and hammer, and the tips after it was hardened. Sure the test can be better but tell me like I can make it. I enjoy it and every idea will be apreciate.If I can do it, I will. But never I´ll Know how many J do my bow. The effectiveness of maille has nothing to do with if the garment is hanging freely as mentioned in a post above. It has to do with being mounted on a body (which is very elastic) or other proper mounting surface--I think the use of a sandbag was excellent--and having proper padding worn under. IIRC, the Japanese wore layers if silk garments under their armor. Silk fibers are known to be an excellent armor material because the strands are even stonger than Kevlar (pound for pound) and do an excellent job of absorbing the energy of a stike.